Westchester County Executive Rob Astorino has presented a plan to protect residents from the potential threat of Zika and other mosquito-borne diseases. Astorino presented the plan at a playground at Kensico Dam Plaza in Valhalla on Thursday. He says health departments are coordinating a response. Westchester County Health Commissioner Dr. Sherlita Amler says recently there was a meeting with health officials from lower Hudson Valley counties. 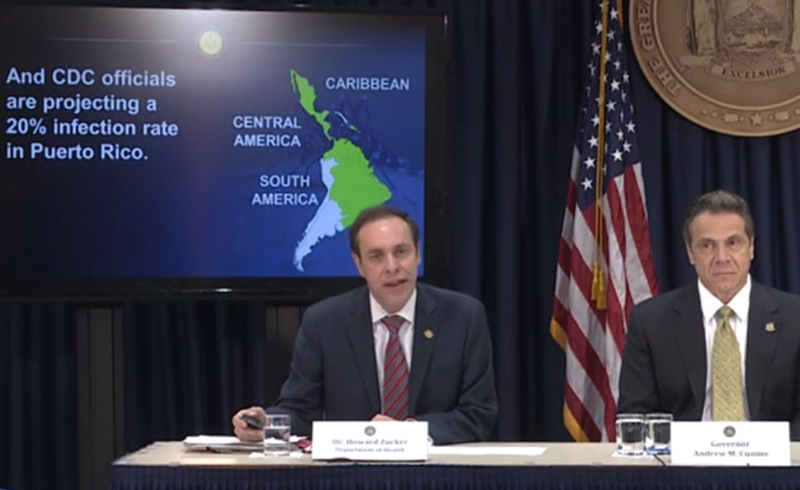 Astorino stressed there are no known locally originated cases of Zika in Westchester or, for that matter, according the Centers for Disease Control and Prevention, in the U.S. There have been two Zika cases in Westchester where the virus was contracted out of the country. Again, Amler. There is no antiviral medication for Zika, which can be transmitted from a pregnant woman to her baby during pregnancy or at the time of birth, with severe birth defects possible. The virus also can be spread via sexual contact or blood. Westchester County’s plan to defend against mosquito-borne illness includes applying larvacide to catch basins on county and municipal roads. This already has been done in half the county. It also includes giving residents free minnows for backyard ponds and other water sites with a bit of depth. So far, says Astorino, the county has given away 100 pounds of minnows to more than 100 residents. Peter DeLucia is the county’s assistant commissioner for environmental health. Delucia says a new part of the plan includes doubling trap sites. Astorino speaks to another new part of the plan. “In the event that a positive mosquito pool or a locally acquired case is identified, then we’ll do targeted ground spraying in a very focused area,” Astorino says. They called on residents to be proactive, by keeping property clear of potential mosquito breeding sites, like standing water, and protecting themselves with a bug repellent. 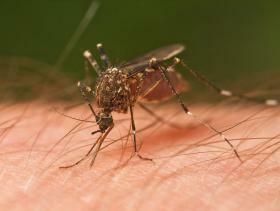 DeLucia notes it takes it take seven-to-10 days to go from an egg to a biting adult mosquito. Prior to 2015, outbreaks of the virus had occurred only in areas of Africa, Southeast Asia and the Pacific Islands. In May 2015, the first confirmed cases were reported in Brazil. Now there are outbreaks in many countries and territories, including Puerto Rico, and throughout Latin America and the Caribbean. With the summer Olympics in Rio, Brazil scheduled for August, Amler recommends that to avoid exposure to Zika, pregnant women avoid travel to areas where Zika is found, including Brazil. She also advises the following. “CDC is recommending that if you travel to an area where Zika is present that when you return to your home that you use insect repellent for three weeks following your return because we don’t want local mosquitoes biting you and become infected with the Zika virus,” Amler says. The county is giving away free minnows and larvacide tablets, known as dunks, at the Westchester County Airport (Loop Road, Building 2) until 6 p.m. Friday and from 10 a.m.-3 p.m. Saturday. Otherwise, residents can get free larvacide tablets by calling 1-888-364-4723. Every year I spend one to two weeks visiting the Caribbean island nation of Grenada. I don’t go for vacation, despite the allure of that country’s white sand beaches, but rather for work. I spend most of my time in windowless classrooms teaching clinical and research ethics to a number of graduate, medical and professional students from across the region. Zika virus may be more dangerous than we thought. The first Zika-related death in the U.S. was reported last week. While communities beef up mosquito control efforts, an upstate Congressman wants more federal funding to fight Zika. The Centers for Disease Control and Prevention has reported nine additional Zika infections in pregnant women in the United States, while 49 verified cases of Zika in New Your State have prompted a response from Governor Andrew Cuomo.